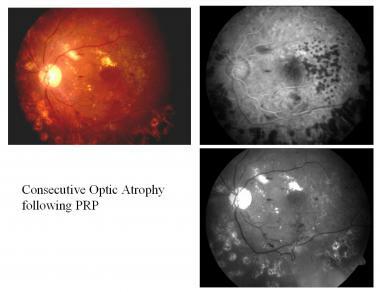 DEFINITION: Optic atrophy (OA) is a pathological term referring to optic nerve shrinkage caused by degeneration of retinal ganglion cell (RGC) axons. Optic atrophy is somewhat of a misnomer as atrophy implies disuse. 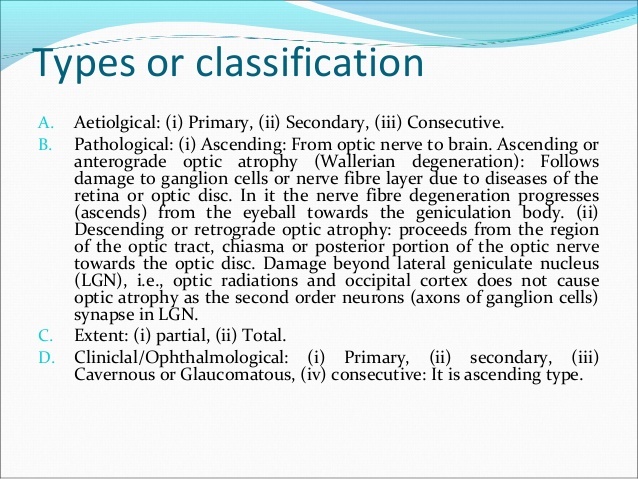 Therefore, OA is better termed “optic neuropathy”. INTRODUCTION: OA is a non-specific sign of a disease process affecting the visual pathway. In adults it implies the retinogeniculate portion of the visual pathway. While the peripheral nervous system has an intrinsic ability for repair and regeneration, the central nervous system, for the most part, is incapable of such processes. The axons of the optic nerve are heavily myelinated by oligodendrocytes, and the axons, once damaged, do not regenerate. 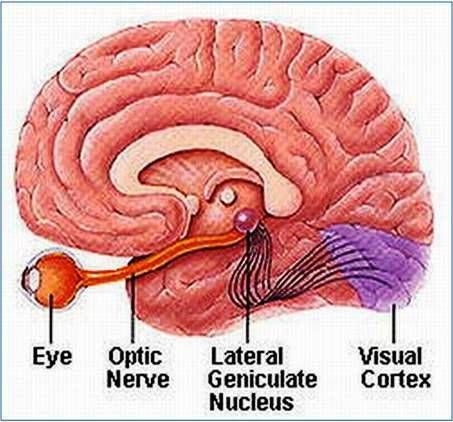 Thus, the optic nerve behaves more like a white matter tract rather than a true peripheral nerve. The optic nerve head (ONH) is supplied by pial capillaries which undergo degeneration leading to pallor of the ONH in OA. When light is thrown on the fundus from a light source it undergoes total internal reflection through the axonal fibers. Subsequently, reflection from the capillaries on the disc surface gives rise to the characteristic yellow-pink color of a healthy optic disc. 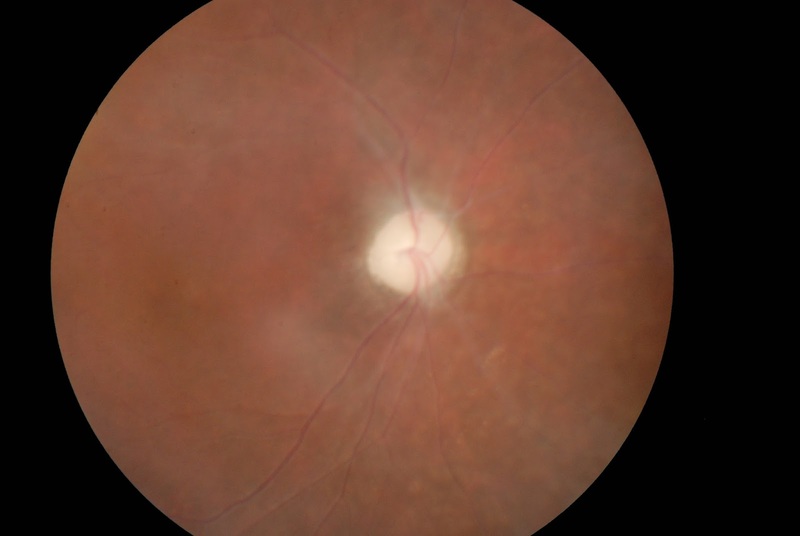 However, the degenerated axons in OA lose this optical property leading to the pale optic disc seen in this condition. Although glaucoma is also a cause of OA, it is regarded as a distinct entity. Clinically, non-glaucomatous OA is usually recognized by a diffuse or segmental pallor of the optic disc. Conversely, glaucomatous OA is characterized by cupping and a preserved healthy neuro-retinal rim until advanced disease. Management of OA is directed at determining the cause and directing treatment at the etiologic process. Non-specific management might be required in cases which do not respond to the specific treatment. CLINICAL FEATURES: Patients may complain of loss of vision with segmental or diffuse blurring of the visual field. There can be reduced color saturation or contrast sensitivity. The normal linear association between stereoacuity and Snellen visual acuity could also be lost in OA. TYPES: OA can be classified in different manners. This can be in the form of Primary/secondary/consecutive or depending on the etiology. “Primary OA” occurs without any antecedent ONH swelling. It is caused by lesions involving any part of the visual pathway extending from the retrobulbar portion of the optic nerve to the lateral geniculate body. It is seen in conditions such as pituitary or optic nerve tumors and aneurysms, hereditary- and traumatic- optic neuropathies, toxic- and nutritional-optic neuropathies and multiple sclerosis and following retrobulbar neuritis. The optic nerve fibers degenerate in an orderly manner and get replaced by columns of glial cells without alteration in the architecture of the ONH. The disc is pale, chalky white with sharply defined margins and the parapapillary blood vessels attenuated. Lamina cribrosa is well defined. Thinning of the RNFL is present with often a reduction in the number of small blood vessels on the optic disc surface (Kestenbaum sign= normally the number of capillaries on the ONH is 10. But in OA the count may reduce to 6). “Secondary OA” follows optic disc swelling (papilledema, optic neuritis, anterior ischemic optic neuropathy). Optic nerve fibers exhibit marked degeneration, with excessive proliferation of glial tissue. The ONH architecture is lost, resulting in indistinct margins. The disc is grey or dirty-grey; the margins are poorly defined and slightly raised, with the lamina cribrosa obscured due to proliferating fibroglial tissue. Hyaline bodies (corpora amylacea) or drusen may be observed. Peripapillary sheathing of arteries as well as tortuous veins may be observed. Progressive contraction of visual fields is usually seen. “Consecutive OA” occurs in diseases affecting the inner retina or it’s blood supply. It can be seen in: retinitis pigmentosa, pathological myopia, following pan-retinal photocoagulation, extensive retinochoroiditis and central retinal artery occlusion. The ONH is waxy pale with a normal disc margin, marked attenuation of arteries and a normal physiologic cup. Visual fields 30-2 and full field. 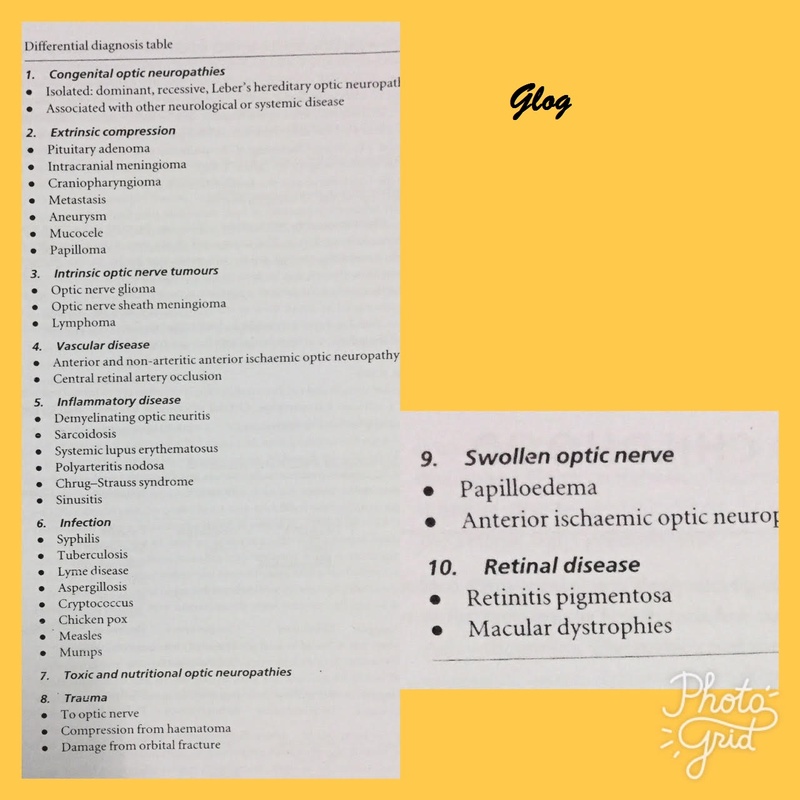 In optic neuropathy, visual field changes can include enlargement of the blind spot and paracentral scotoma (eg, optic neuropathy), altitudinal defects (eg, anterior ischemic optic neuropathy, optic neuritis), and bitemporal defects (eg, compressive lesions, similar to optic chiasma tumors). For tumors located in the orbit, ultrasonography is recommended. For papilledema, a B-scan ultrasound is recommended to look for optic sheath dilatation. To find out whether a lesion is cystic or solid (eg, cysticercoids), CT or MRI is recommended. For solid lesions, MRI (with contrast or fat suppression) is preferred in areas in close proximity to the bony wall. For fractures associated with trauma, a noncontrast CT scan is preferred. For multiple sclerosis, a gadolinium-enhanced MRI/fluid-attenuated inversion recovery (FLAIR) sequence is useful to detect hyperechoic areas. In optic neuritis, the VER has an increased latency period and decreased amplitude as compared to the normal eye. Compressive optic lesions tend to reduce the amplitude of the VER, while producing a minimal shift in the latency. TREATMENT: There is no proven treatment to reverse OA. However, treatment of the exact causative factor prior to significant damage might be helpful in saving useful vision. Low vision aids (LVA) may also be of benefit in selected cases. In optic neuritis, arteritic anterior ischemic optic neuropathy and traumatic optic neuropathy intravenous methylprednisolone has been found beneficial. Idebenone, a quinone analog, is the only clinically proven drug in the treatment of Leber hereditary optic neuropathy. Stem cell treatment may prove to be a key in the future treatment of neuronal disorders.